Love that it’s not a Casino hotel, much quieter. The scent of the Hotel when you walk in is amazing. Great location!! Nice place with good amenities. Especially for family. Amazing view from the window. I liked the location of the property. But we weren't able to request any ubers or service at the front. It was difficult to contact management for the right amount of towels and extra toiletries. The security desk was very nice. Amazing place! We loved staying here and would definitely come back. Super modern, clean, and comfortable! 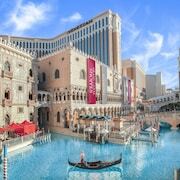 There are plenty of places to stay in Las Vegas with 936 accommodation options including 66 apartments. You might want to check out the great live music and entertainment choices while you're in the area. Hoover Dam and Fashion Show Mall are popular attractions to discover. Are you thinking about an apartment instead of a traditional hotel? Often offering more space than a traditional hotel room, apartments include a kitchen for convenient home-cooked meals. Though weather is just one aspect, it can really affect your travel plans, especially when planning a longer stay. Since apartments often have more stringent cancellation policies, it's good to understand these weather averages before booking. Las Vegas is well regarded for its live music and great entertainment. Cultural attractions include Ethel M Chocolates Factory and Clark County Museum, whereas Ethel M Botanical Cactus Gardens and Red Rock Canyon are a couple of picturesque spots to enjoy the outdoors. You can also visit some other popular places in town including Hoover Dam and Fashion Show Mall. Fly into Las Vegas, NV (LAS-McCarran Intl. ), which is located 2.4 mi (3.8 km) away from the city centre. You can also search for flights into Las Vegas, NV (VGT-North Las Vegas), which is 6.7 mi (10.8 km) away. If you'd like to explore around the area, you may want a rental car for your journey.